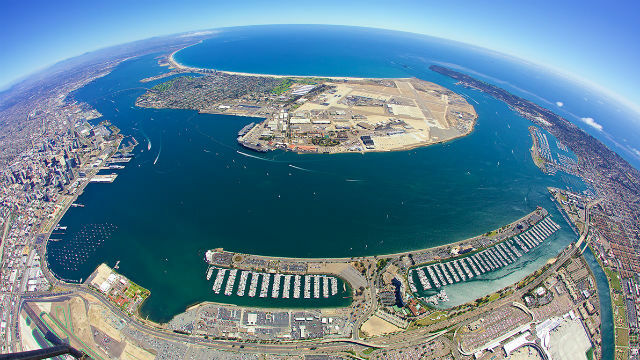 The Port of San Diego announced Tuesday it was honored in three of the four categories in an international environmental care awards program. The American Association of Port Authorities introduced its Environmental Improvement Awards program in 1973. The APAA is an alliance of ports in the United States, Canada, Latin America and the Caribbean. The three awards are the San Diego port’s first since 1999, when it won for Environmental Enhancement. The port won this year in the Stakeholder Education category for its Environmental Education Program, which supports hands-on environmental education and conservation practices. Its second win came in the Environmental Enhancement category for its Threatened and Endangered Species Stewardship Program, which helps manage the populations of two bird species labeled as endangered by the U.S. Fish and Wildlife Service. The birds, the California least tern and the western snowy plover, nest along the San Diego Bay. The port also won in the Mitigation category for its Marine Debris Removal Project, a partnership with a debris removal company based in Solana Beach in an effort to better address debris in the San Diego Bay. “Being recognized by the AAPA for three of our Green Port programs is a tremendous honor. In our commitment to being a 21st Century Port, these and other various projects and initiatives are aimed at keeping our bayfront beautiful and ensuring it remains a vibrant resource for all who visit it and call it home,” said Port President and CEO Randa Coniglio. The awards announcement came as the port begins celebrating Green Port Month.